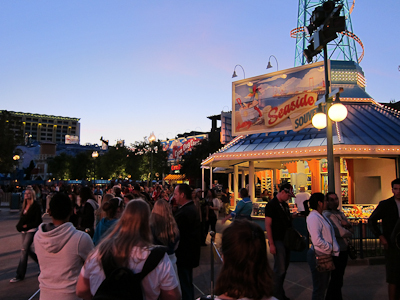 I don’t generally wander over into Disney California Adventure Park, formerly known as Disney’s California Adventure and now I think it’s all weird and stuff to not have the ‘s on Disney, so I’m just going to abbreviate it DCA like it’s always been done. There’s a lot of cool stuff going on at DCA, most notably Carsland (Cars-land), an entire land based on the movie franchise Cars, which is going to be unbelievably awesome but does not open until 2012. 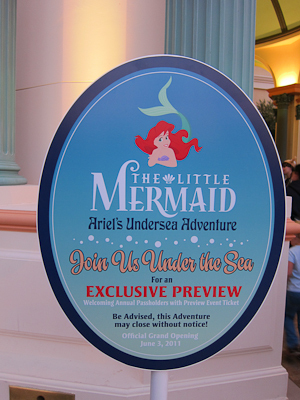 In the meantime, Disney opened up a new ride–The Little Mermaid. It’s like a regular dark ride, but better! Because it’s new! It officially opens on June 3rd but like Star Tours (which also opens on June 3rd), they are holding Annual Passholder previews and today we went to one of them. 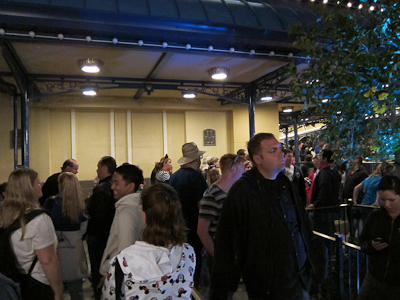 Unlike Star Tours, you didn’t need a special winning email to get in line. Anyone with an annual pass could do it. So we did. This post is about the line. Why? Well, I usually do the line and the ride in the same post, but this line was so long it really deserves its own post. Plus I don’t like to document a ride the first time I ride it–I’d rather just enjoy it. So yes, this is about the line. The whole post. About a line. I’ll try to keep it as entertaining as possible. 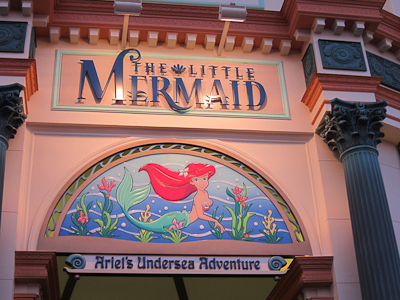 The Little Mermaid took over a space that used to house some kind of movie thing with Whoopi Goldberg or something–I have absolutely zero idea since I never, ever went inside the building. First I should point out that the whole line actually only took us an hour. Not that I like waiting an hour for a ride, just that this is the longest line I’ve ever been in in physical distance, but it moved continually and the whole thing was only an hour. 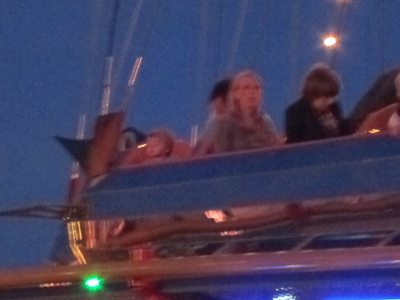 Also, you’ll notice that it was light when we started and dark by the time we got on. You might think this means that the line is short, but you're wrong. Now first you get in line parallel to the building. 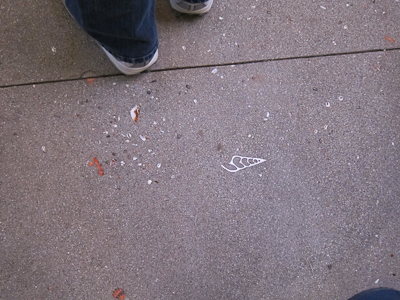 Looking down at the concrete, there are seashells embedded. It’s quite cute. And to your immediate right you see the line headed the other direction getting on the ride. It's going to be a walk-on! No, no, no, no, no it isn't. 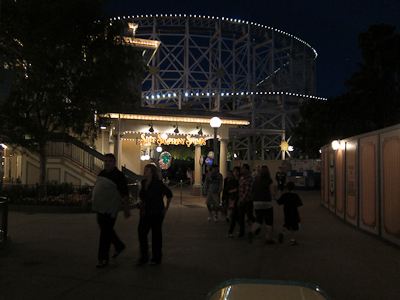 You move to the end of the lighted walkway and think you’re going to flip back around and get on the ride. Poor, unfortunate naive souls! Instead you hang a right and zig-zag a bit. Twisty tree bushes--how do they make those things grow like that? That’s the Grand Californian Hotel in the background, by the way. 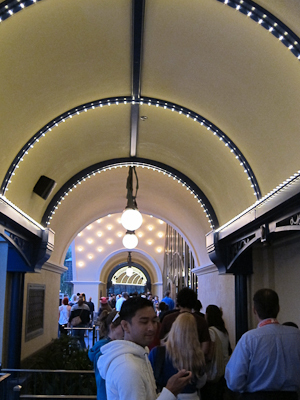 So after you twist and turn for a while, you feel like you should go right, which will bring you back to the lighted walkway and thus to the ride. 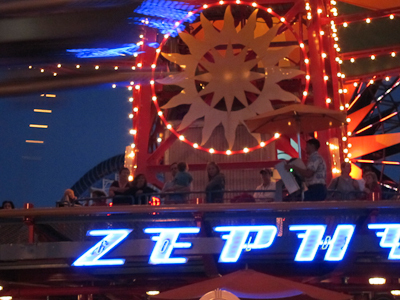 You actually go left and end up facing the Zephyr ride. 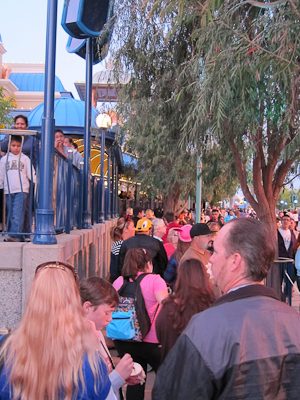 This doesn't seem that bad--wait, are all those other people in line? Now here’s where I’m going to start referring you to a crudely-drawn map. I got this screen cap from the official Disney site and it actually lies. 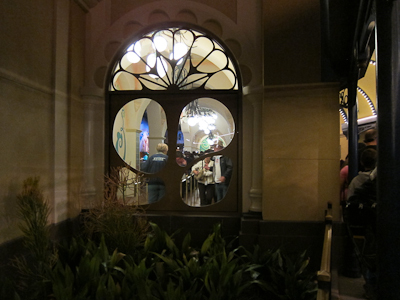 Not only does The Little Mermaid not appear, the Grand Californian Hotel also does not appear. 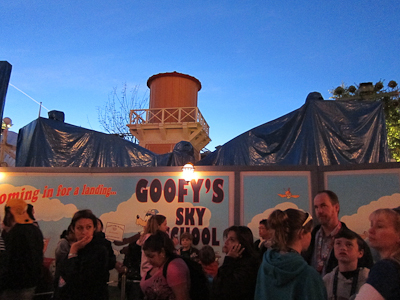 And Goofy’s Sky School, an actual roller coaster which will open in July, I think, is not on the map. And just when you thought there couldn’t be more things not on the map, there are! There’s a souvenir stand and the Corn Dog Castle. 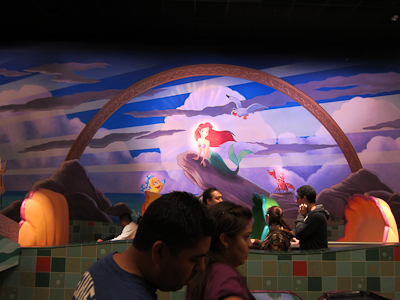 So on the map, the circle thing with the TLM and arrow is The Little Mermaid. The red circle is the stage, which I’ll get to in a second. The yellow line is the lighted walkway, roughly, and the square is the zig-zagging area. The two pink circles are the souvenir place and the Corn Dog Castle. 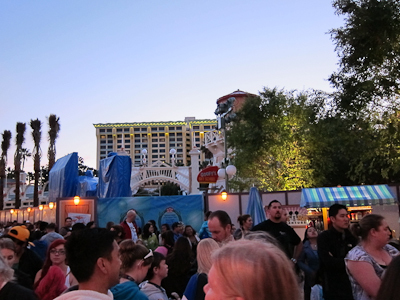 And then there’s a wall and Goofy’s Sky School behind it. Basically all of those trees are a total lie. Okay, now that you know where you are, or not, the above part of the line is in orange, with 1 being the lighted part and 2 being the zig-zag. It still doesn't feel that bad. So okay, this is pretty much going to be the longest blog post dedicated to a line ever written in the history of blog posts dedicated to lines. 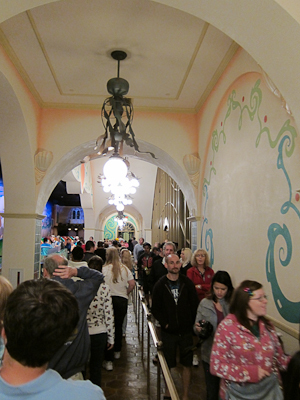 At this point, the people on the walkway are leaning over saying "Are you still in line for the Little Mermaid?" Yes, my friends. Yes we are. Now Theo is a typical 2 and 1/2 year old, which means that he has a really hard time standing in line. He has a really hard time staying in one place in general, like anywhere, but line standing gets to be tough for him. Still, at this point he’s hanging in there. Then you get all the way down to the stage. 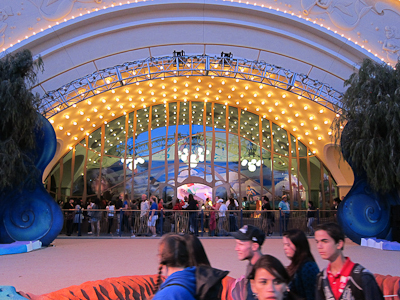 Now this is a super, super, super cool part of the ride, because the boarding area is open and there’s a giant stage in front of it. I don’t know what they plan on doing on the stage but I did see a permanent industrial-grade bubble machine, and Theo really, REALLY likes bubbles. I took this opportunity to snap a shot of the stage. And then you go right back down to the end of the lighted path again. We're heading the wrong direction! The ride is THAT way! 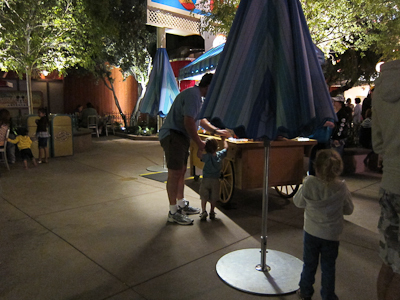 This is where Theo got all antsy and Kevin jumped out of line with him to take a walk around. Anyway, in case you wanted to get back to the maps again, the black arrows trace that last part. That is some quality drawing in Paint, isn't it? Then it starts to get really disheartening because you approach the souvenir shop that according to the map does not exist. And then there’s just this like big mob of people. 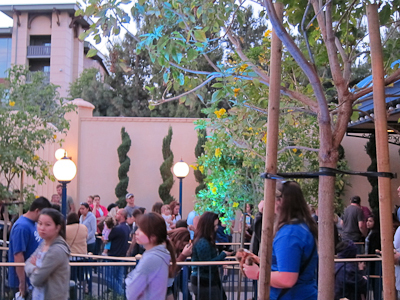 At this point, Disney completely dispenses with stanchions and even rope and just sticks 5 zig-zags worth of tape on the ground. You know there’s that story about how in Communist Russia, people were so used to waiting in line that one day someone just started a random line leading to nothing in front of some building and then like a hundred people lined up behind him? Well who knows if that’s true or whatever, but at this point in the line you’re really starting to feel like it. Here’s our friend, the map. And here’s where the Disneyland map gets weird on its perspective, because Communist Russia, denoted by the unhappy face, actually takes place more in front of the souvenir stand next to the yellow zig-zag square but in front of the Zephyr, which is that red post with swinging things that look like shiny silver logs. 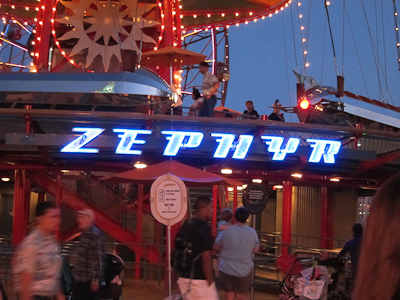 And speaking of the Zephyr, this is where a very bored Theo becomes very interested in the Zephyr. 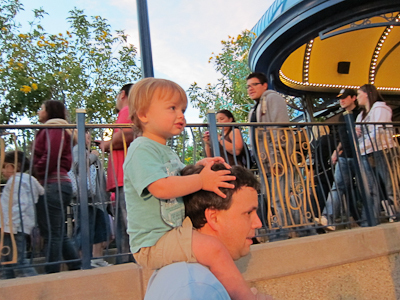 So interested, in fact, that Kevin and Theo bugged out of the line to go ride it. My brother-in-law joined the Army this year and has spent the last 6 months in helicopter repair school. He graduates in a few weeks (we’re so proud!!) 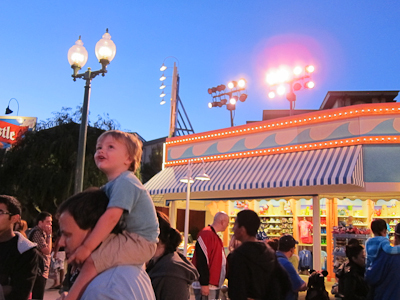 and Theo has been fascinated with helicopters ever since we told him that Uncle Zach will be working on one. Also we bought him a toy helicopter and made a lot of “chk chk chk chk chk” noises. He loves it. and two, the line was not even remotely headed in the direction of the building. In fact, it could not be pointing any further away. Behind that long wall on the right is Goofy’s Sky School, formerly known as a Mulholland (I think) themed roller coaster. I’m not sure what’s taking them so long to open it, as I think they aren’t making any real changes to the ride. They were running test cars tonight. You follow along the wall until you pass the Jumpin’ Jellyfish ride, which is some sort of bouncy up and down thing that seems pretty tame. And also, there’s a Yo Gabba Gabba dance called the Jumpin’ Jellyfish so if you’re the parent of a Gabba-watching toddler, that song will be stuck in your head. 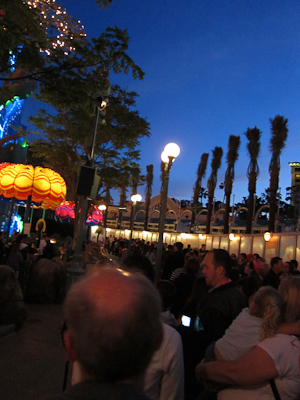 You actually go past the Jumpin’ Jellyfish almost all the way to the Silly Symphony Swings before turning around again. 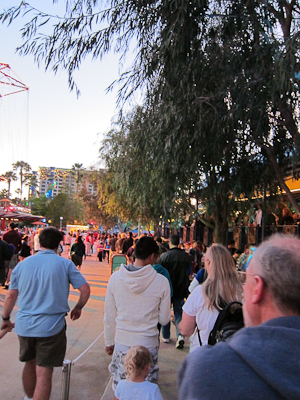 Once you feel like you’ve walked all the way to Buena Park and are now at Knott’s Berry Farm, you turn around and get to look at the entire line you just walked. But there’s good news, because at least you’re walking in the right direction! We're getting closer--I can feel it! Also I can see it. 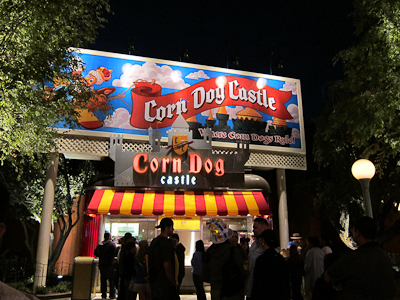 And if you were hungry, which I was, you really should have grabbed a corn dog when you passed the Castle the first time around. With Communist Russia on your right and the building in front of you, you can almost taste it! Should've grabbed a corn dog. Seriously. 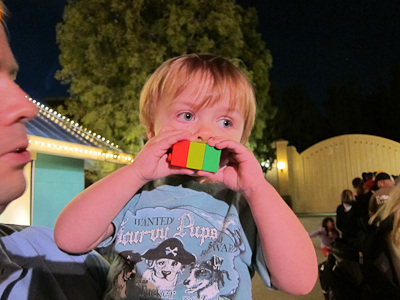 At this point, Theo was REALLY bored and Mommy had to bust out the emergency stack of Legos. But you’re making progress! You’ve almost touched the building! Now I'm getting excited again! And at long last, you get to the lighted pathway again. And a part of the clamshell you ride in! Are you effin' KIDDING me??? But then finally–FINALLY!!! You do get to board your clamshell. 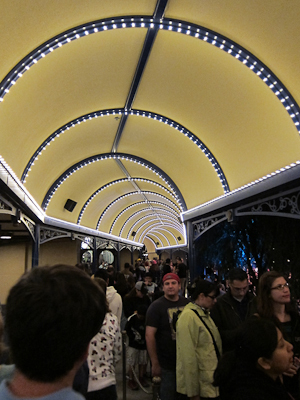 The nice thing about this ride is that it’s an Omnimover, which means it has a continuous load/unload, so as long as this line was, we never physically stopped moving. The second thing is that they made the shells nice and big–you can easily fit 3 people in there, 4 if you’ve got a couple of small ones. This is in stark contrast to rides with similar vehicles like the Haunted Mansion and Peter Pan, where 3 adults is a tough or impossible squeeze. The line finally comes to an end, much to yours and everyone else’s celebration. Then you get to your undersea adventure.The crazy thing is, after all of this effort, the line is sure to change. I do think, however, that this will be the basic layout until the crowds thin out a little and they can start chopping off big portions of it. And also, despite all of the pictures above, it only took us an hour to get on the ride. It was a great ride, really! I’ll blog it as soon as I get more pictures. But here’s a little reward for hanging in there with me throughout this whole post. Thanks for hanging around. Hope you didn’t die of boredom!!! I’m glad to hear that the line looked more intimidating than it was. Once again I won’t ride it until September, so hopefully I’ll get lucky with less of a line. I think it will definitely be better in September. Plus it keeps moving, so that feels like it’s shorter. Wow!! I looked at the scrollbar alongside this post when I was at the top and thought, “Nahhhhh….” But the post– and the line!– really were that long! You and Disney made it entertaining, though. 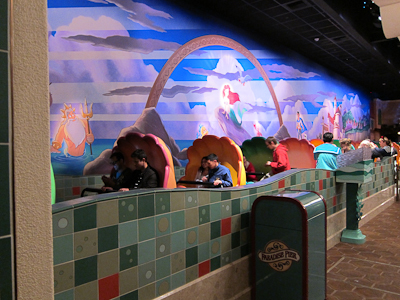 I loved the seashells embedded (Disney’s details impress me) and loooved your map notes. Also, Theo has rad parents. Awwww, thanks! Theo did really well too, given his general need to move around a lot. My 18-year old daughter will be at the park Friday, June 10 after being bused all night following her high school graduation — ah youth — not sure if she can stomach that kind of a line, but I loved how wittily you wrote about it. 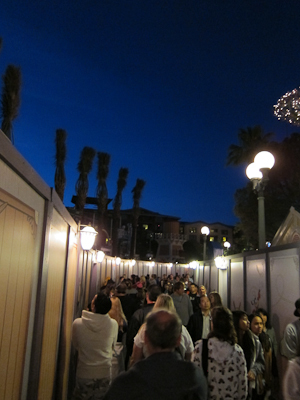 Maybe Toy Story will have less line? 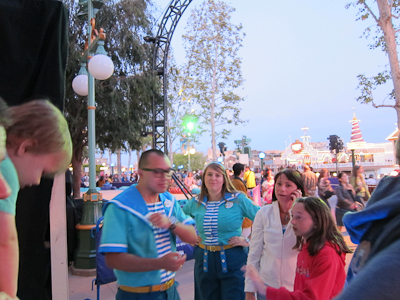 Ah, Grad Night! The Toy Story line will likely be long as well, but you never know. I’m sure she’ll have a great time, and congratulations to her! Thank you for reading all the way to the bottom! And I’m sure everyone was suitably impressed with my advanced Paint skills. I’m thinking of applying to Disney for an animator job ;). My mom reads your blog, so I was skimming through and couldn’t help but see a few confusing things. I have been an annual passholder for about 6 years (I’m 17), and now I am practically going to the parks weekly. 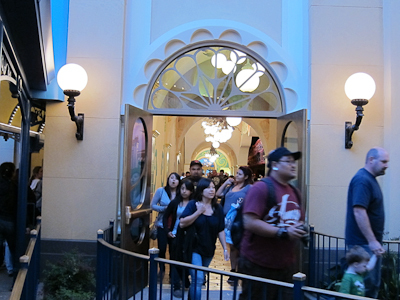 It seems like you are always caught up in huge lines that take forever (this, Jungle Cruise, Princess Fantasy Faire, etc.) 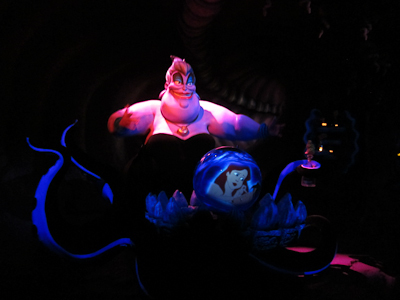 I went to the AP preview of the Little Mermaid ride yesterday and stood in line for exactly 23 minutes. Maybe you are visiting during busier hours? But from what I understand, you are a stay-at-home mom, so shouldn’t you be able to visit during those less-crowded times during the week? I can’t remember the last time I waited in line for something for longer than 30 minutes, so I wish you luck for better wait times in the future! Hi Kate–thanks for reading! I think sometimes my posts make it seem like i wait longer than I do. I just like to complain a lot :LOL:. I am pretty restricted as far as my schedule since my son naps for a good portion in the afternoon. 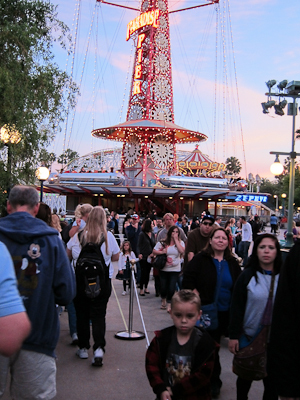 It’s funny the way that going to the park at different times of the day can really affect your wait times. 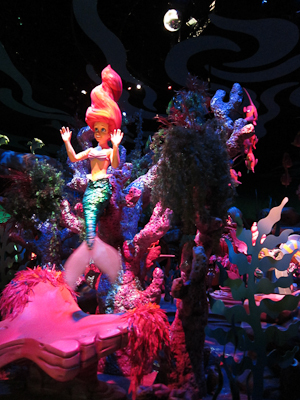 My first Little Mermaid ride was Wednesday night about 7:00, so unfortunately the peak time. The second was right after opening and fortunately we got through in about 35 minutes. I too hope I can get short wait lines in the future as well! It’s a good experiment to see what times of the day are better than others! FYI, the Mulholland rollercoaster you referred to was called “Mulholland Madness,” and was decorated in a freeway theme. Like Mulholland Dr., the ride itself was very twisty-turny, but otherwise quite tame (definitely a beginner’s coaster). 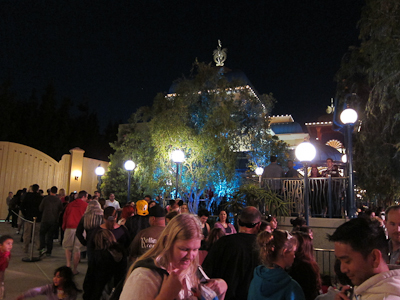 As you noted, I understand that the ride itself is staying the same, with only the decorative theme changing. That’s right–I knew it was Mulholland something. Thanks! And it doesn’t look like they’re really changing anything, even leaving the existing signs in place. I wonder what’s taking so long? I love that you did a post on the line! and I’m also so glad that you included the maps so that we could really picture the whole thing. You really are a mom after my own heart having an emergency stash of Legos to pull out for emergencies. Mine was usually a matchbox car, a few small books, a cup of fishy crackers that I held onto when all else failed. Keep up the great blogging. 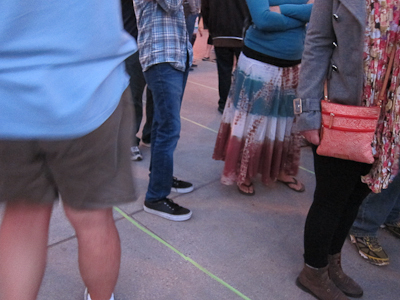 The sad thing is that the next morning the line was in a completely different place *sigh*. And as a friend pointed out, it took me pretty much the same amount of time to make this post than it did to wait in the actual line :lol:. Matchbox cars are always a staple, and the goldfish are a permanent feature in both cars and the purse. I also carry around crayons we got at restaurants (see my D23 posts!). You just never know.